Glucose Polymer Maltodextrin, Dextrose Monohydrate, Whey Protein Isolate, Cocoa (Processed With Alkali), Natural And Artificial Flavors, Soy Lecithin, Sucralose, Calcium Silicate (anti-caking). 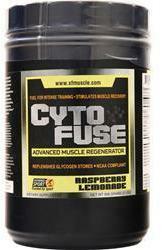 Add 2 scoops of Cytofuse™ to 8-12 ounces of water and consume post workout. Add or subtract fluid volume to adjust for desired taste and consistency. For those needing higher serving sizes add 4 ounces of water with additional scoop. Glucose Polymer Maltodextrin, Whey Protein Isolate, Dextrose Monohydrate, Natural And Artificial Flavors, Malic Acid, Citric Acid, Soy Lecithin, Acesulfame Potassium, Sucralose, FD&C Yellow 5. Glucose Polymer Maltodextrin, Dextrose Monohydrate, Whey Protein Isolate, Citric Acid, Fructose, Malic Acid, Natural And Artificial Flavors, Soy Lecithin, Sucralose, Acesulfame Potassium, FD&C Red 40. Fuels the body during intense trailing.